US President sends World Jewish Congress head to Jordan to ask Jordanian, PA officials to convince Abbas to negotiate with Israel. 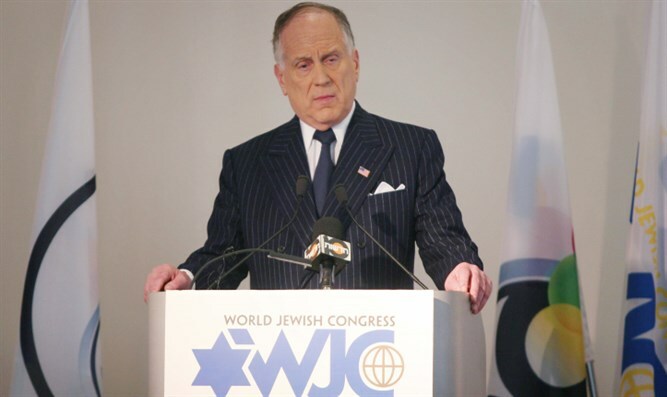 US President Donald Trump sent World Jewish Congress President Ronald Lauder as his personal envoy to Jordan Thursday. According to Channel 2 News, Lauder's meeting with Jordanian leaders occurred without the knowledge of the Israeli government or Jared Kushner and Jason Greenblatt, the officials who are formulating the administration's Middle East peace plan. Lauder also met with PLO negotiator Saeb Erekat and Majed Fares, the head of Palestinian Authority intelligence and a confidant of PA chairman Mahmoud Abbas. The message sent by Trump's emissary was intended to convince the PA's aides to persuade him to respond favorably to the Trump administration's efforts to move the peace process forward: "It is worthwhile for him to return to negotiations."